Summers in Italy are usually long and hot. To reduce the effects of Italy’s stifling summer heat, something cool is a must. Something like a caffe shakerato (iced coffee), maybe. Ice cream is ok, but its effects never really last long enough. The fruit and mint flavour liquid ice granitas are much more effective at bringing one’s body heat back down to acceptable levels, and I find that their effect is longer lasting. Then there is the caffè shakerato – which is not only refreshing, but it puts a smile on your face. It gets its name from the cocktail ’shaker’ used to make it. It’s very good, and the combination of caffeine and cool seems to help reduce the effects of the searing Italian summer heat. Even if the effect is probably only psychological, it doesn't matter, after a shot of this, you will feel refreshed! Agitation is the essence of this popular Italian coffee. 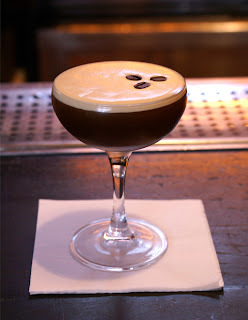 The drink takes shape when freshly pulled shots of espresso and chocolate syrup are combined with cracked ice and a bit of sugar in a cocktail shaker. It's shaken vigorously to aerate the espresso, then strained into a slim cocktail flute. At its best, the shakerato retains both chocolate richness and espresso complexity, layered with an attractive head of reconstituted creama. It is reccommended to chill the glasses in advance and using prepared simply syrup (equal parts sugar and water, boiled and cooled) rather than granulated sugar as the syrup dissolves more quickly in the cold liquid. Fill a cocktail shaker halfway with cracked ice cubes. Pour the espresso, sugar and chocolate syrups, and vanilla over the ice. Shake vigorously for at least 30 seconds and strain into a chilled glass that has been lined with a spiral of syrup. Garnish with a citrus peel. Works well, in fact I think I’ll have another shakerato moment a little later on this afternoon!